fromTheFreeThoughtProject: Using a new law, Seattle police raided a man's home and confiscated his guns with zero due process for entirely legal behavior. fromReason: Oregon law bans discrimination in selling goods based on age, so this lawsuit looks like a winner. fromBreitbart: The Daily Mail reports that Google searches for “NRA membership” rose “4,900 percent” since the Florida attack. fromLibertyPen/YouTube: Objectivist philosopher Ayn Rand enlightens Donahue on a variety of topics. fromCreators: They've finally did it. 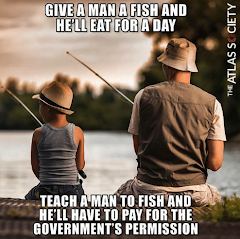 They are taxing you for the rain that falls on your property. fromLibertyPen/YouTube: From the Rubin Report, Psychologist Jordan Peterson discusses rule one of his new book, “12 Rules for Life”. fromLewRockwell: Government is the last place one should look for deciding how to protect school children, how to run schools, how to run police and how to produce law enforcement for its citizens. fromTheFreeThoughtProject: Safe driving is now a reason for police to pull you over, check the inside of your car, demand your papers, and stomp what is left of the 4th Amendment into the ground. fromVox: Forget Obamacare's tyrannical dictates. Blue Cross of Idaho said it hopes to start selling noncompliant plans by early March. fromReason: No adults seem embarrassed by this reaction. They should be. fromLibertyPen/YouTube: From 51 years ago, a classic interview with Objectivist philosopher Ayn Rand. fromWolfStreet: A rare defense of physical money by an ECB Board Member. “Protection of privacy matters to all of us. Privacy protects people from the risk of a surveillance state and thought police,” he said. fromPeoplesPundit: Nullification occurs when a jury votes “not guilty” because a law is either unjust or wrongly applied, not because a defendant is actually innocent. fromFreeThoughtProject: With the legalization of marijuana comes the bolstering of the police state and the new mouth swab checkpoints for weed are evidence of it. fromBillWhittle/YouTube: Remember when the world made sense and movies showed us evil just long enough to be vanquished? What happened? What spell have we been under? fromCNNMoney: End-stage socialism is always a tragic sight. Cash is gone. fromLibertyPen/YouTube: The brilliant philosopher expounds on three powerful concepts. from PowerlineBlog: The New York Board of Regents eliminated a requirement that aspiring teachers in the state pass a literacy test to become certified. Why? Hispanic and black candidates had a harder time passing it than whites. from Reason: American police are currently obsessed with enforcing exactly which body parts can be massaged and by whom. from LibertyPen: The guiding philosophy of the left revealed in one four minute video (excerpt from the Fountainhead). from Breitbart: Given that Mueller was the head of the FBI a the time, he really shouldn't be heading an investigation that involves looking into the FBI's actions. Arrested, cuffed, raped, and Brooklyn DA sees a consent question? from NY Times: The relationship between security and liberty is often described as a balancing act. This act can’t take place if we’re not informed about the technology used to safeguard our security.